For decades, treatment of compressive optic nerve neuropathy was conservative and involved the intravenous application of high-dose corticoids, which was combined with nerve growth factors in later years. If surgery was considered, transcranial and transfacial access to the orbital apex and the optic nerve were achieved using classical approaches. Over the past decade, endonasal endoscopic procedures have increasingly come into force, based on favorable experiences with functional endoscopic sinus surgery and as a result of innovative developments in endoscopy and image guidance. The purpose of this review is to address the latest literature in this field with regard to the indications, techniques, results, and complications associated with this procedure. There are basically two approaches for endoscopic optic nerve decompression: the extradural supraorbital “keyhole” approach, which provides access to the optic nerve canal roof and which is usually performed by neurosurgeons, and the endonasal endoscopic approach, which is widely used by otorhinolaryngologists. The development and application of endonasal endoscopic surgery was only possible with extensive knowledge of the topographic anatomy. The most important anatomical landmarks and topography have been described based on either cadaveric or CT scan studies, and include the opticocarotid recess, the distance between the optic nerve canal and the internal carotid artery, the ophthalmic artery, and the length of the optic nerve canal. There are two main indications for endonasal endoscopic optic nerve decompression: (1) traumatic optic nerve neuropathy (TON), and (2) optic nerve neuropathy from non-traumatic causes (nTON), such as tumorous conditions, inflammatory diseases, or idiopathic intracranial hypertension (IIH). In trauma cases, rates of postoperative visual improvement of 40–80% have been reported. Factors influencing the outcome include the severity of the injury, initial visual acuity (light perception or better vs. no light perception), the time interval between trauma and intervention, and the type of injury, such as fracture lines directly through the optic nerve canal or probable avulsion trauma. nTON cases generally have a slightly better prognosis, with vision improvement of 54–100% reported. The procedure should be performed before any optic nerve atrophy can occur. In IIH cases, all major symptoms, including vision loss, headache, visual field deterioration, and papilla edema, improved after optic nerve decompression, with rates of 60–100% reported. Earlier studies reported the occurrence of major complications such as cerebral fluid leakage, severe hemorrhage, or optic nerve injury at rates of about 3%. However, more recent studies postulate that no major complications occur, which may reflect the increasing use of the endonasal endoscopic route to the optic nerve and skull base as standard procedure, so that surgeons are becoming more comfortable with the technique. Endonasal endoscopic optic nerve decompression is a safe and highly effective treatment to reduce hydrostatic pressure on the optic nerve in cases of optic nerve neuropathy of various etiologies. In TON cases, about 50% of patients will benefit from the procedure, with vision improvement possible in some cases even with an interval of some days between trauma and surgery. Non-trauma cases have a slightly better prognosis. The intervention should be performed prior to optic nerve atrophy. • Abhinav K, Acosta Y, Wang WH, Bonilla LR, Koutourousiou M, Wang E, et al. Endoscopic endonasal approach to the optic canal: anatomic considerations and surgical relevance. Neurosurgery. 2015;11(Suppl 3):431–445; discussion 445–6. https://doi.org/10.1227/NEU.0000000000000900. Important paper on the anatomy and topography of the optic nerve canal and its effect on the endoscopic endonasal technique. • Liu Y, Yu H, Zhen H. Navigation-assisted, endonasal, endoscopic optic nerve decompression for the treatment of nontraumatic optic neuropathy. J Craniomaxillofac Surg. 2018. https://doi.org/10.1016/j.jcms.2018.12.009. Important study evaluating the impact of the use of a navigation system on the effect of decompression in non-traumatic optic neuropathy. Sowerby LJ, Rajakumar C, Allen L, Rotenberg BW. 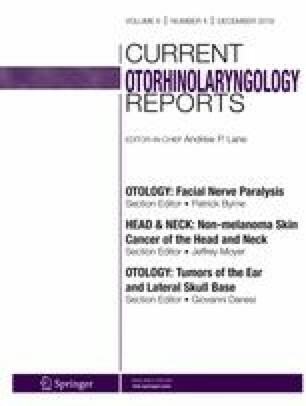 Urgent endoscopic orbital decompression for vision deterioration in dysthyroid optic neuropathy. Eur Ann Otorhinolaryngol Head Neck Dis. 2018. https://doi.org/10.1016/j.anorl.2018.08.007. Medsinge A, Sylvester C, Tyler-Kabara E, Stefko ST. Bilateral endoscopic optic nerve decompression in an infant with osteopetrosis. J AAPOS. 2018. https://doi.org/10.1016/j.jaapos.2018.05.012.